Remember how enthusiastic you were when you first began practicing yoga? Making time for a lengthy daily yoga session was probably a priority back then. As life and work intervened, it may have become more difficult to keep up your ambitious yoga schedule. In fact, you may have used one or more of these excuses to talk yourself out of unrolling your yoga mat. If you're busier than ever, it may seem impossible to carve out enough time for a yoga session. Although longer sessions are more beneficial, you can enjoy the benefits of yoga even if you only have 15 minutes of free time. When time is an issue, wake up early and enjoy a little yoga and meditation while the house is quiet. Lunchtime yoga may offer just the boost you need to make it through the rest of the day. If there's no space for your mat at the office, try a few seated poses at your desk. You can even split your usual hour-long yoga session between the morning and evening hours if you wish. Squeezing another activity in your already busy schedule may not seem like the best idea if your free time is limited, but yoga offers important benefits for your general and mental health. Yoga reduces stress and insomnia, relaxes tight muscles, eases aches and pains, improves concentration and flexibility, and decreases high blood pressure. Do you spend your free time in front of the television because you're just too tired to practice yoga? When you're exhausted, even the corpse pose may require too much energy as far as you're concerned. Fortunately, yoga offers an all-natural solution to your fatigue that just may help you feel more refreshed. When researchers studied the effect of yoga on people with chronic fatigue syndrome (CFS), they discovered that participants who performed bi-weekly yoga sessions with an instructor and practiced on their own every day had significantly more energy than those treated with medications only. Whether you have CFS or are just exhausted from a grueling schedule, yoga offers a simple way to decrease fatigue. Complicated poses can seem a little intimidating when you first start performing yoga. Keep in mind that no one performs difficult poses on their first day of class or even the 10th. Yoga classes emphasize building skills and increasing flexibility gradually. Before long, you may be amazed at just how flexible you've become. If flexibility remains a challenge, your instructor can provide modifications or recommend blocks and other aids that will help you get the most out of your yoga practice. Some types of exercise just become too difficult to perform as you get older. If you've developed painful arthritis after years of running, your favorite form of exercise may no longer be the best activity for you. Because yoga doesn't stress your joints and involves gentle motions, it's an ideal form of exercise no matter what your age. 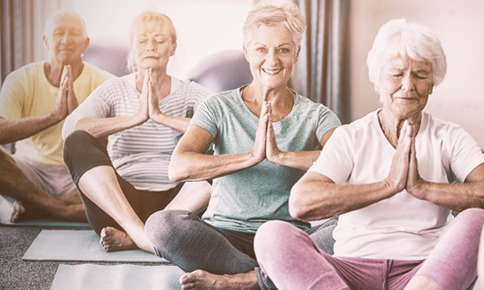 Yoga offers several important benefits for older people. It reduces your osteoporosis risk; improves heart health, balance and breathing; and may even improve the symptoms of dementia and osteoporosis. Although yoga isn't a competitive form of exercise, it's only natural to compare yourself to others in your class. If other students seem to be more advanced than you, you may feel a little intimidated. Keep in mind that it probably took your fellow students months or years to perfect their poses. If you stick with your classes, you'll probably notice a significant improvement in your ability in just a few months. Keep in mind that your instructor is always available to offer advice that will help you master difficult poses. He or she is committed to making classes a positive experience for all students and wants to know if you have any concerns. If you don't think a class is a good fit for you, you can always try another type of yoga or switch to a different class. Don't let these common excuses keep you from enjoying the benefits of yoga. Regular sessions are the best way to ensure that you enjoy all of the amazing health benefits of yoga. If you're interested in enrolling a class, give us a call and we'll help you find the perfect class.